A woman with disabilities is speaking out after she got off a Sunwing Airlines flight only to find she was stranded without a wheelchair at Pearson International Airport. A woman with disabilities is speaking out after she got off a Sunwing Airlines flight from Cuba only to find she was stranded without a wheelchair at Pearson International Airport. Susan Horrigan told CBC Toronto she was at the gate at 2 a.m. on April 11 waiting for Sunwing staff to deliver a wheelchair she had arranged in advance. "It was like they all had blinders on," she said about the Sunwing crew walking past her. But Sunwing told Horrigan and CBC Toronto that providing a wheelchair is not the airline's job. Horrigan had the same travel agent she's used for six years arrange for the wheelchair, which was delivered without a problem for every other trip. For Horrigan, her yearly vacation to Cuba is therapeutic. "[The heat] does wonders for my shoulders and my back but especially my legs," she said about the April vacation with her husband. Horrigan has systemic sclerosis, an autoimmune disorder that has caused her muscles to atrophy over the last several years. "My legs are the worst. That's where most of the pain is," she said. Her weakness is compounded by nerve pain in her lower body and it all makes standing for longer than a few minutes feel like torture, she said. "It's like my legs are being cut open." She explained she needs a wheelchair to navigate the expanse of an airport whenever she travels. She showed CBC Toronto the confirmation for the wheelchair request and the airline also confirmed it with us. "The pain was getting worse and worse," she said. She tried to walk a bit with her cane but she worried her husband, who was busy with two large suitcases, was not going to be able to catch her if she fell. Finally, at the baggage carousel, she says she found an empty airport authority wheelchair and sat down. That's when a Greater Toronto Airports Authority (GTAA) staff member approached the exhausted couple to offer help with a motorized cart to take her to the exit to hail a cab. "And God bless her," said Horrigan. She said the experience was emotionally painful as well. "I didn't have any dignity that day," she said. She subsequently emailed Sunwing about the experience and wrote: "This is a health issue and I could have ended up in a hospital and it would be solely upon Sunwing's shoulders!!" A Sunwing representative responded that the airline regrets the incident but the company had done its part on the request. "After a thorough investigation of your file, we can assure you that the request was properly added for both flights by our Special Service Representative," the email read. The employee wrote that it's the job of a subcontractor to deliver the wheelchair, not the airline's responsibility. "We have to mention that airport employees, both at destination and in Canada, are not employed by Sunwing/Signature Vacations. They are hired by a subcontracting company," said Martin Ozzy, whose email is signed as a "Resolution Agent - Post Travel" with Sunwing/Signature Vacations. In a statement to CBC Toronto, a Sunwing spokesperson said Horrigan's situation was mishandled but also wrote it's not the airline's fault. Rachel Goldrick wrote that airport authorities and carriers use a customer assistance program "which centralizes mobility device inventory as well as dispatch services." It has also shared the details of the incident with the subcontractor, Toronto Ground Airport Services, which did not respond to CBC Toronto's request for comment. Goldrick added in spite of this, the airline could have done better in this case and after CBC Toronto's inquiry said Sunwing is reviewing its procedures when processing special requests like this. "Notwithstanding, we maintain that we could have dealt with this non-performance issue on the part of a third party supplier better at the time it occurred and in subsequent follow up with our customer," Goldrick wrote. 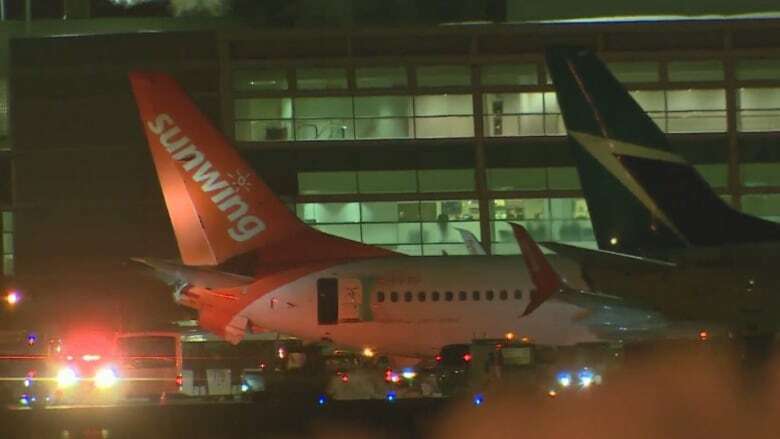 As for the GTAA's role, spokesperson Robin Smith said in a statement, "Sunwing is responsible to provide mobility assistance to their passengers." Smith explained that airlines are responsible for taking passengers curbside to the plane. Sunwing promised to "make amends" with Horrigan, who said she just wants to ensure this doesn't happen to others, regardless of who's contracted to do the work. "They're hurting someone who needs assistance," she said. Horrigan received a call from Sunwing apologizing again for what had happened telling her that the team is working to ensure something like this doesn't happen again. They told both her, and CBC Toronto they reviewing their procedures to identify opportunities for improvement.